At the inception of the concept of highlighting good poems being posted on p4poetry, we decided to have a poem of the day. But as the website grew we felt the need to replace Poem of the Day with "Crowned Poem". 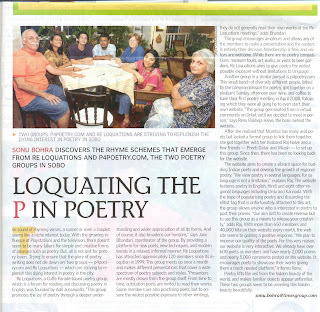 The two concepts are similar, albeit the frequency of poems being highlighted/put into limelight. Poem of the Day meant that every day our team would select the Best poem posted on the previous day and crown it. Instead of doing this act daily, the frequency from now on will be erratic. If on a said day 5 outstanding poems have been posted, all of them would be crowned. However if on a said day the poems are mediocre, no poem will be crowned. The chnagehas been brought about to ensure that the best poems get crowned and if at all on a day two poems are good, both can share the limelight!! Keep writing, your poems will get a Crowning Glory soon! p4poetry.com has begun showing advertisements. We're sorry that we're no more an ad-free website, but to runa website, we did need finances to sustain and further ourselves. We hope that all of you members will understand and will bear with the small block of ad showing up besides the poem. .....we are introducing the concept of "comments on the comment". Now you can reply to each comment separately by clicking on 'comment on this comment'. However, if your comment is not in reply to a preceeding comment, you can 'post it as a new comment' (like you used to do previously) and not as 'comment to this comment'. Also, all the discussion on a comment will be shown as threaded together. So, it is easier to track who said what and in response to whose comment! P4poetry.com Welcomes Vishvanand ji to the Team! A Hearty Congratulations, once again! And yes,as we continue growing...we will keep on adding "Moderators" in our team from the existing P4poetry members ! Change is the flavour of life. Did you want something new on p4poetry? Well, your wishes are our command. Do you see new things on the website? Yes...? Spot on, so you spotted the new from the old! - Congrats! 1. Crowned Poem on the top side-bar. Instead of the latest poems, now you can see a list of 5 latest crowned poems on the top side-bar. This was done to out the crowned poems in the limelight and make access to them easier. Click on any poem and you'll see the member picture and profile on the top-side bar. The perfect solution for the person-behind-he-poem-curiosity! So everyone, please update your profiles, for isn't it nice to share things about yourself, when you love to read about others? 3. The multiple news highlight is out, a slick news tab on top-side bar is in! Out goes the pink news highlight on the website main page, in comes the slick news/update section. Redirect your mouse and your mind to the new tab on the side-bar for any update/news. 4. Direct link to the forum. Now, instead of a text introducing the forum, you'll directly be taken to the forum page if you click on the forum tab. Enjoy the new and improved p4poetry.com!! Test your Funny Bone - September Contest is OPEN!! After four serious poetry contests, we decided to let your thoughts go crazy and explore the funny side of the poet in you!! Yes, this September we're having a Funny poem/Hasya Kavita contest! YOU can vote for the MEMBER-IN-SPOTLIGHT !! Who said only the founder members have a say in who becomes the Member-in-Spotlight?! You do too! For the month of September 2008, we're letting YOU Choose who you want to crown the Member-in-Spotlight! The member with maximum votes will be in spotlight for the whole of September 2008. You can also send in the questions you want to ask the Chosen member in spotlight once the voting results are out! Last date to Vote - 15th September. This is your golden choice, for voting is your birth right at p4poetry.com!! Winner for August 'Picture' Contest! The August month saw a twist in the poetry contest. Instead of the usual themes we had a picture contest! 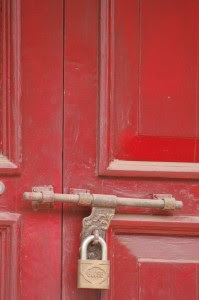 The picture was of locked red door. The key to the lock was sending an entry for the contest, ofcourse!! Members had to interpret the picture and write a poem as per their interpretation and creative skills. The entries were fantastic! The Runner up is - Trapped by Apoorv, who was the Winner of our very first Poetry Contest held in April 2008!